Being racehorse breeders and hoteliers, you can’t avoid the comparisons between the way we do things and how others go about their businesses. Survival in the modern world depends upon how you distinguish your product from the rest, and whatever Summerhill and Hartford are today, it’s because they were built on an intuitive understanding of what gets a pulse racing. It’s about authenticity, atmosphere and adventure, sounds, scents and scenery, tastes and taboos. Good hotels and good horses always reflect a sense of “place”, their environment, their histories, their traditions and importantly, their people. In the world of travel, a high level of discernment is creeping into every arena. Today, the customer’s interest in artisanal beer and food, for example, is echoed in a craving for artisanal hospitality. That Hartford House is answering that call, is evident in its proclamation among the three leading country restaurants on the planet, by the senior food critic at The Wall Street Journal; a compliment to Hartford’s dedication in sating people’s interest in the world’s distinctive places. their neighbourhood. Our places thrive because of their originality, they survive on account of their old fashioned values. The more technologically focused the world becomes, the less people want to check-in via iPad and have their pillow preferences stored in a computer. Instead, our guests like to arrive and be greeted by their surnames; they soon get to know themselves again by their first names. Counted in the world’s top three country restaurants by the senior food critic at America’s most famous newspaper, The Wall Street Journal. Voted Eat Out’s Most Popular Restaurant in South Africa, and the only KZN-based restaurant to make Eat Out’s national Top Five. 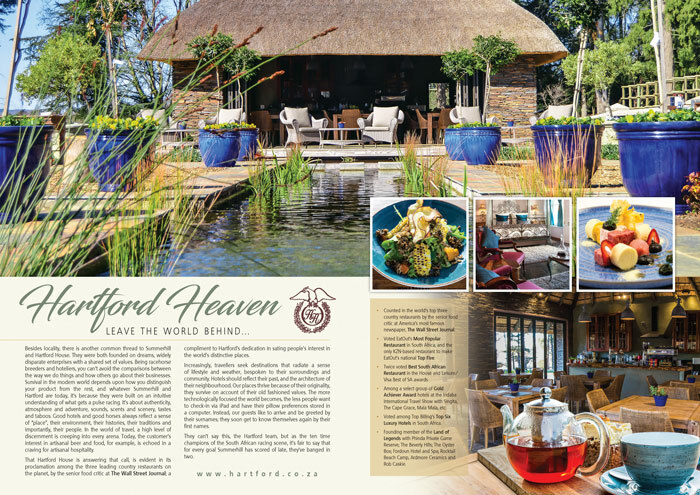 Twice voted Best South African Restaurant in the House and Leisure/ Visa Best of SA awards. Among a select group of Gold Achiever Award hotels at the Indaba International Travel Show with Singita, The Cape Grace, Mala Mala, etc. Voted among Top Billing’s Top Six Luxury Hotels in South Africa. Founding member of the Land of Legends with Phinda Private Game Reserve; The Beverly Hills; The Oyster Box; Fordoun Hotel and Spa; Rocktail Beach Camp, Ardmore Ceramics and Rob Caskie.